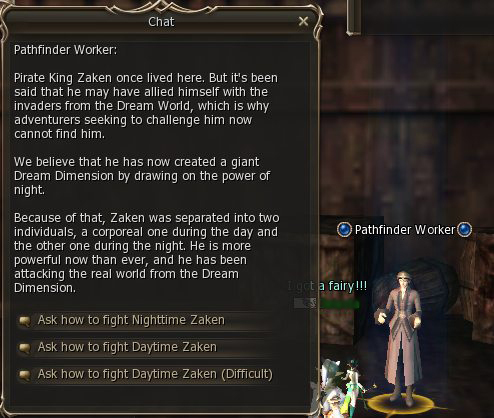 Contrary to the official statements, there are rumors and vague GM statements at the forums, that hint that the Russian players that have been playing longer than a year will not be banned (and all who have an account on Zaken who is just a year old). They will only be prohibited from creating new accounts. That seems to be true, as everyone can still log normally today (I have no data about Ukraine though). However the disconnects keep occurring regularly, thus ruining the game of players. We don’t know if these are DDOS attacks or not but they are extremely frequent. 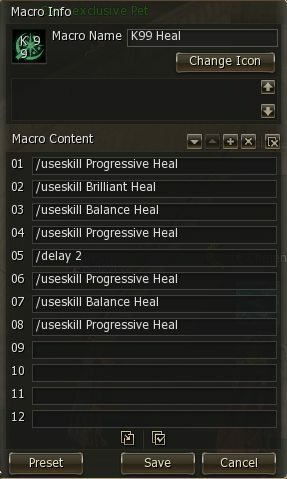 For the duration of these disconnects the forum/website servers are also down. The last disconnect and the unavailability of the website lasted for longer than 10 minutes. Unless they have massive problems with their servers (which is unusual for such a company) this does look very much like ddos attacks. It is almost impossible to play today with those frequent disconnects. Update: We have an official confirmation now that these are indeed DDoS attacks. 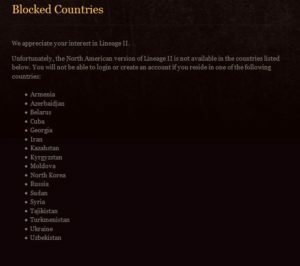 Last night we experienced a lot of problems in the American Lineage 2 servers. There were massive disconnects, multiple times and huge lag. Some people were speculating that those were DDOS attacks on the servers but I was very skeptical about it. 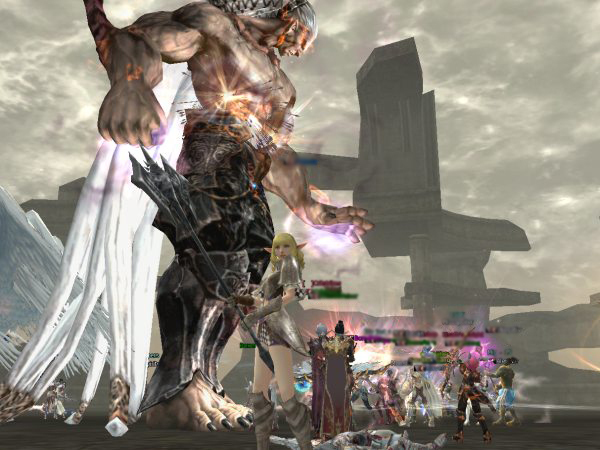 There were no motives for a DDOS attack on NCSoft. But today, things have changed. Today we know there was a motive. 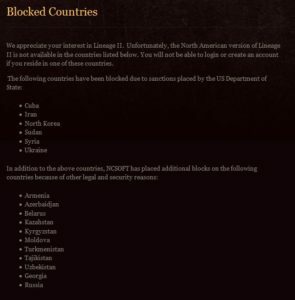 Yesterday, NcSoft West blocked Ukraine IPs and today announced that it will block 17 countries from its American servers. Most of the countries are Russian speaking countries but also some Middle East and Asian countries. 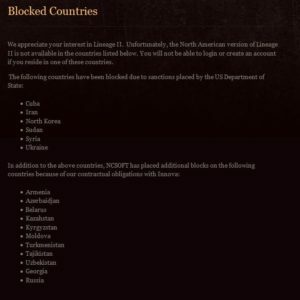 On its first announcement the 17 countries were listed all together without any explanation as to the reasons of this block. 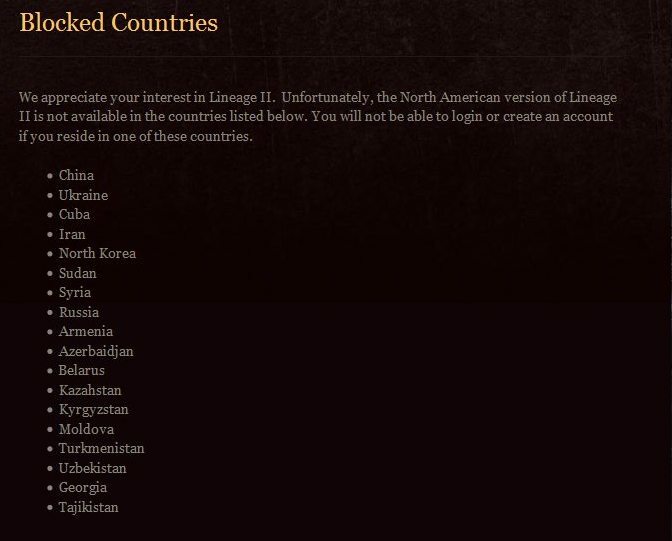 A few hours later, the page was updated to include two lists of countries. 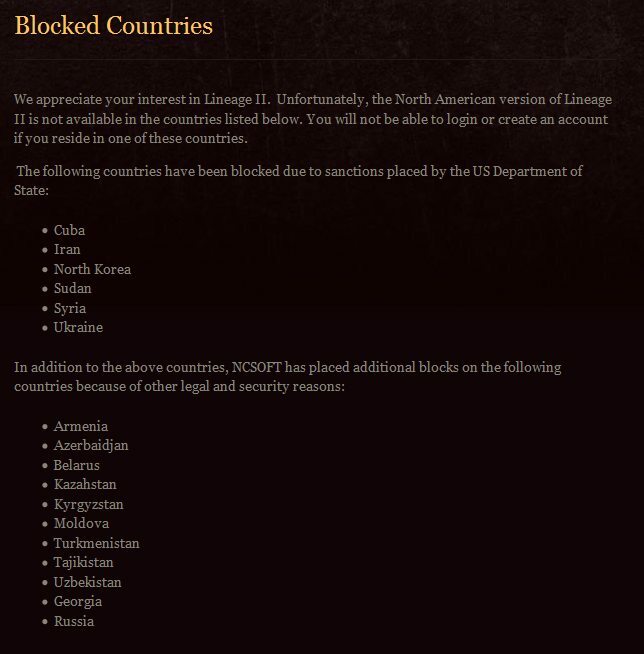 The first list includes countries banned “due to sanctions placed by the US Department of State”. 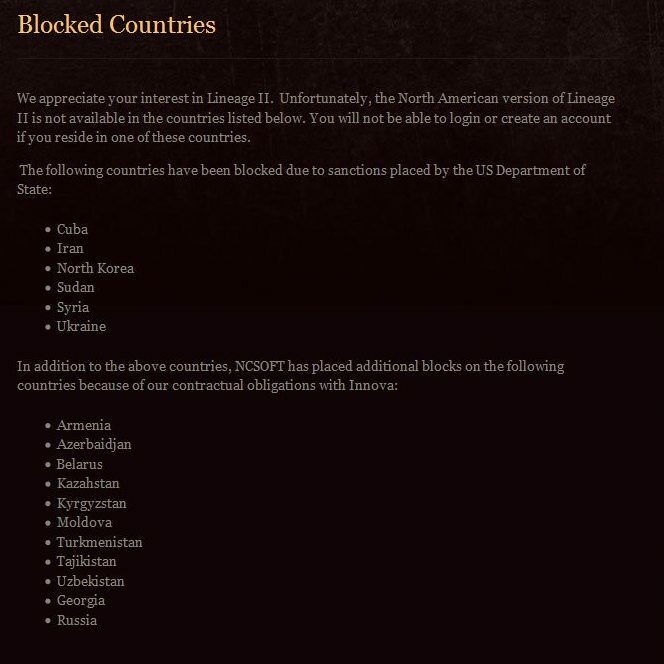 The second list has countries that were blocked “because of our contractual obligations with Innova” in NCSoft’s words. You can view the official statement here. Update: A new third version has now appeared that presents a totally different reason. “because of other legal and security reasons”. I guess “legal” includes the obligations with Innova. Update: Now a fourth version has appeared *lol* that simply does not list any reasons. Update… again: There is a fifth version now online that includes China. All countries are in alphabetical order, apart from China at the bottom of the list. 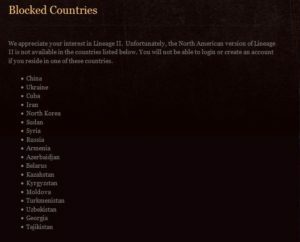 There are A LOT of Russian speaking players on the American servers. Players who have dedicated years of their life into developing their characters, building clans and creating a social network. There are also A LOT of Russian speaking players that have used the NC-Store to buy virtual items that worth many thousands of dollars. Right now they are basically getting rid of some of their best customers. For the Russian speaking players, this means that their fruits of years of work and effort are destroyed in a day, without warning and without any compensation. At least none has been announced yet. From the political point of view, I could understand how countries like Iran and Syria are blocked from being customers of an American company. BUT why were they customers until now? What has changed? 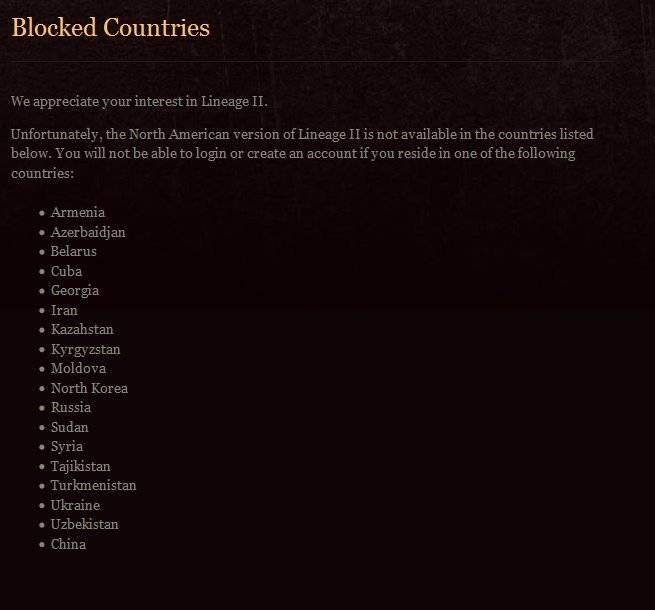 The other good question is: Why is Ukraine in the list of countries blocked for political reasons? This statement, this inclusion in that list shows that the US is not shy to support Russia in their conflict with the Ukraine. But why now? What changed? Some players argue that we are seeing the results of the US elections, although I find that hard to believe, since the new president will go into office in January 2017. I just don’t understand the reason to bring politics into this game. It is just a game! It is not even a sport and players are not competing for their countries. 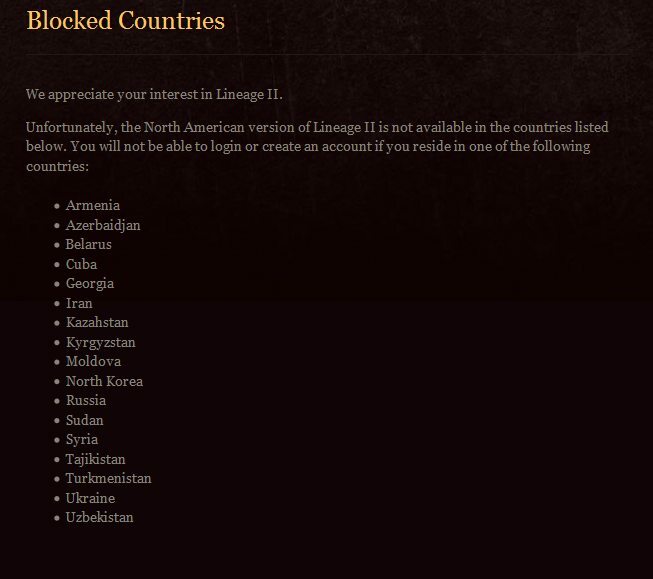 By blocking these countries the US seems to be blocking all commerce with them. Why would they do that at this particular moment and is there something going on that we do not know of? 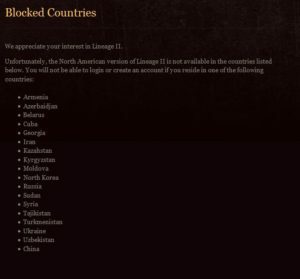 It will be interesting to see if they will allow Russian players to play with VPN. But good VPN costs and it is also not certain that the speed will be sufficient for this kind of game. The community is suffering now. The Ukrainian members of our community are banned and we suddenly found ourselves today saying our last goodbyes to our Russian friends. 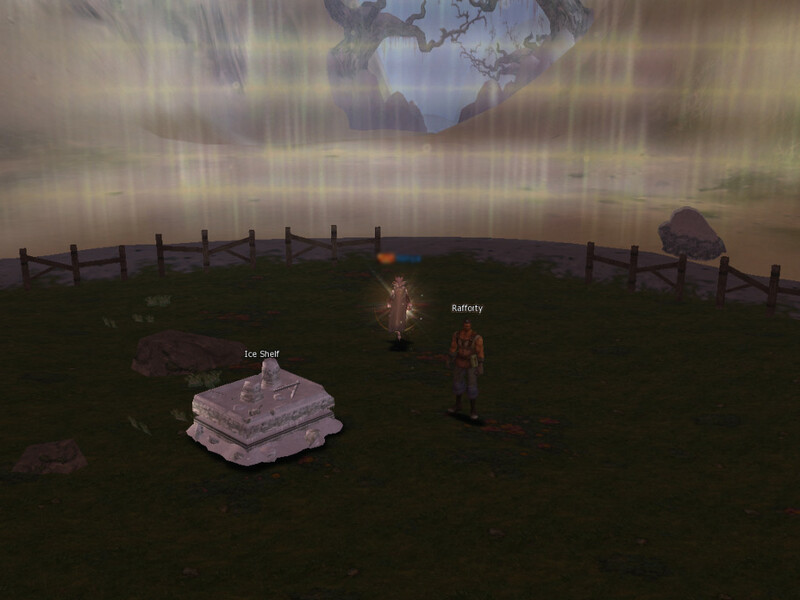 We took screenshots of our last instances together, our last drops, because the bonds we create with people online are real. 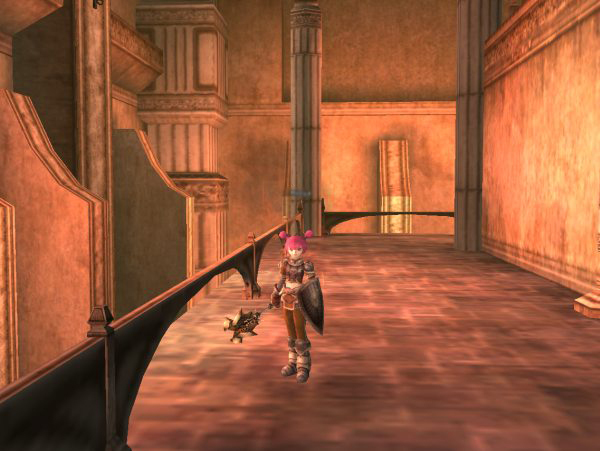 Lineage II is not merely a game but a social network as well. The internet used to be a place free from prejudice, free from racism, free from politics. It wouldn’t mind where you were from, you could meet people from all over the world. It was an open and free world. But look at it now. Surveillance, blocks, restrictions and attempts at control of this unique world, make it the last free world to conquer. The last free world to wage war on.